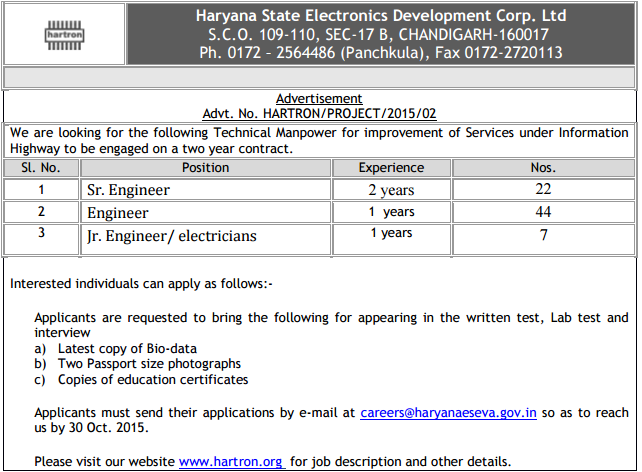 Hartron Recruitment 2015- The Haryana State Electronics Development Corporation Limited (HARTRON) has released a notification to recruit following posts such as Sr. Engineer, Engineer and Jr. Engineer. Interested candidates may send their bio-data in respected form latest by 30.10.2015 at [email protected]. 1. Sr. Engineer- Candidates should have BCA/ BIT/ BE/ B.Tech/ MCA or Graduate (any discipline) with 1-year computer diploma with 02 years work experience in IT/e-Governance related field. 2. Engineer- Candidates should have BCA/ BIT/ BE/ B.Tech/ MCA or Graduate (any discipline) with 1-year computer diploma with 01 years work experience in IT/e-Governance related field. 3. Jr. Engineer/ Electricians- Diploma/ITI OR must be a 10+2 (any discipline) with 1-year electrical work experience. Age limit- Candidates age should be between 21 to 35 years as on 28.08.2015. For Sr. Engineer- Rs.23,500/- and 10% increment per year subjected to the performance. For Engineer- Rs.20,000/- and 10% increment per year subjected to the performance. For Jr. Engineer- Rs.15,000/- and 10% increment per year subjected to the performance. How to apply for Hartron Recruitment 2015 Engineer Jobs? The keen and interested candidates must send their applications by email at [email protected] so as to reach us by 30 Oct. 2015. 3. Copies of education certificates. Note: These positions will be initially for 2 yrs, renewable contract basis at various levels/positions. For complete jobs description, visit www.hartron.org.